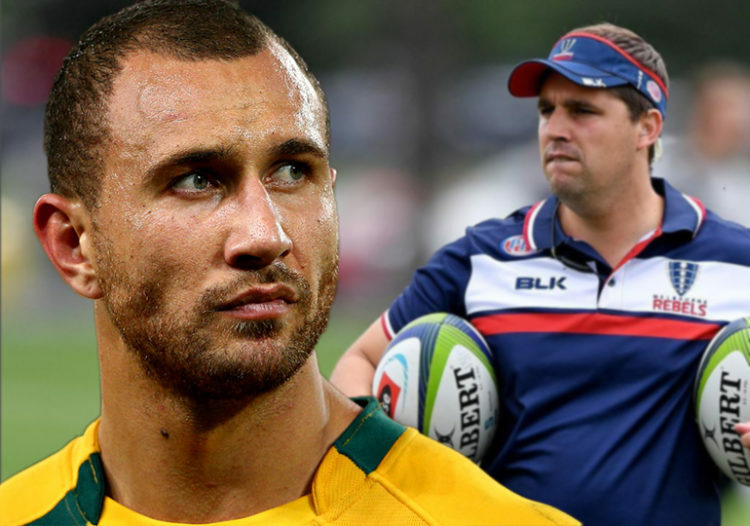 Quade Cooper is back in Super Rugby and on a mission to complete an incredible journey back to the Wallabies No 10 jersey, according to Melbourne Rebels coach Dave Wessels. Cooper’s relationship with Australian rugby has been on a rollercoaster since 2018 when Brad Thorn kicked off his term as Reds coach by dumping the 70-Test Wallabies flyhalf. Four years after helping the Reds clinch the 2011 Super Rugby title, Cooper indulged in celebrity boxing, played Sevens at the 2016 Olympic Games and dipped his toe in European rugby with Toulon before spending last season playing club rugby for Souths in Brisbane. In October, Cooper signed a one-year deal with the Rebels, reuniting with former Reds and Wallabies halfback partner Will Genia under Wessels, the former Rondebosch Boys’, UCT and Western Force coach. Cooper hasn’t started at flyhalf for Australia since October, 2016, but the possibility of a return to those heights became more tangible earlier this month when the 30-year-old was invited to join the Wallabies on a week-long conditioning camp in Sydney. His timing appears to be perfect as Australia’s flyhalf job is up for grabs. The man who took Australia’s 10 jersey off Cooper, Bernard Foley’s streak of 24 consecutive starts at flyhalf ended in September last year and he has since lined up at pivot in only three of eight Tests. Wessels believes Cooper’s experience and insight will help the Rebels improve on last year’s 7-9 record and ninth-placed finish. Biggest coward in international rugby. Doesn’t like talking players from the front. Instead he dances around you and goes for some kind of cheap shot. Usually around the neck. Also look for him to dive on players after they scored. Usually preceded by him making one of his trademark “half tackles” on said player. Probably likes to punch guys after the bell in the boxing ring too. If he was a dog, he’d be a ankle biter! Sadly, I agree. A leopard and spots comes to mind. Lol Chris, probably not on your Christmas list! Anybody who stood up to McCaws cheating is a hero in my book. He’s a mercurial player and will never fit in with a team that plays a forward orientated structured game,-as such he’s perfect for the Wallabies and Rebels and would never have been selected by Thorn who is a dour kiwi with not much imagination or rugby IQ. To me, Thorn has always been the Antipodean version of Bakkies Botha. Quade Coopers not my cup of tea but I think he’s an above average player and deserves to play at Super rugby level. He should try the Lions as well, I hear they need a backup to Elvis JouMaSe. I’m curious to see how Quade has developed over the years. No doubt he’s talented, he just needed some maturity. This will be an interesting Super Rugby season. Players competing for the wild card spots in the World Cup squads.